The most striking change in the private health care market in Britain in the last decade has been the growth of for-profit medicine and the contribution to that growth of American-owned hospital corporations and insurance companies. 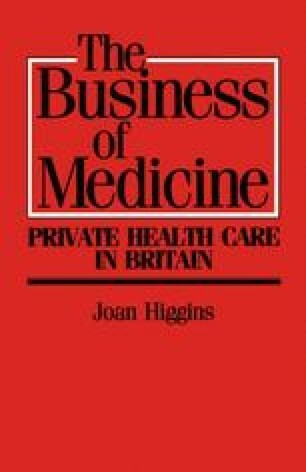 In 1979 there were just 3 hospitals in Britain owned by American companies, with 366 beds. By 1986 there were 31 acute hospitals with 2239 beds and AMI was rivalling Nuffield Hospitals as the single biggest provider in the country. Although it had fewer hospitals, the ones it did own were relatively large and sophisticated and its total bed numbers were rapidly reaching comparability with Nuffield. Each of the American for-profit corporations in Britain is an organisation with extensive commercial interests in many parts of the world. They have both the power and resources to mould the British market in ways to suit their needs. The outcome is likely to be a major shift from the ‘cottage industry’ gently nurtured by Nuffield and BUPA since 1948, towards a much more aggressive, competitive, profit-oriented enterprise. This chapter examines the recent growth of American-owned for-profit facilities in Britain. It looks at the context from which they have emerged and at the possible consequences of growing commercialism in health care. It examines the thesis that these developments are aspects of a medical/industrial complex with far-reaching significance in western capitalism.